When you have lost a tooth it can be a pretty traumatic event. You need your teeth to chew, to keep other teeth in place, and for your self-esteem. It is often embarrassing to have one missing, and people might find themselves no longer smiling. Understand you are not alone, it’s amazing how many people have lost teeth, and are walking around with implants! Start asking random strangers! Replacing a tooth used to require either a removable appliance or a bridge. Those are still options, however implants have become much more popular options for a myriad of reasons. They are titanium alloy screws that are very compatible with human tissue. We place them in your jaw, then allow you to heal, which involves the body osteointegrating with the implant. It essentially becomes one with you. This new metal root is then restored with a crown and connecting abutment. 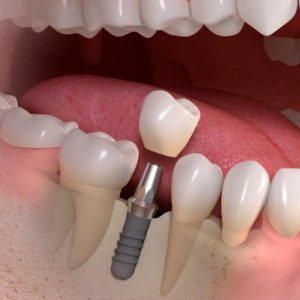 It’s important to realize there are two parts to the procedure; the implant, and the crown. Everything from start to finish is typically done in our office, and the procedure, while sounding scary, is quite painless. It also does take some time to complete one of these. After an extraction you need several months to heal before the implant is placed, then several more while it integrates before we can complete the crown.